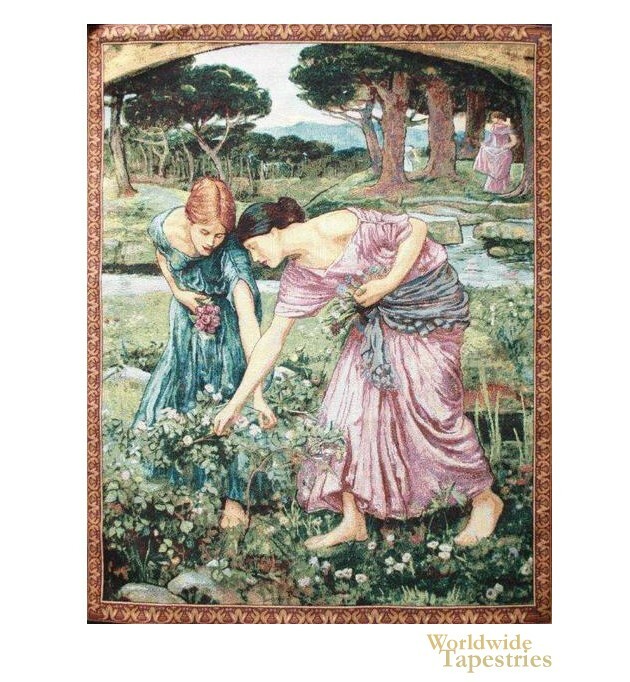 The Gathering Rose Buds tapestry is based on the work of artist British Pre-Raphaelite artist, John William Waterhouse from 1908. Here we see a work inspired by the poem from the 17th century "Gather ye rosebuds while ye may, Old Time is still a-flying; And this same flower that smiles today, Tomorrow will be dying." It is related to the other piece called "Offering the Roses". Here we see maidens in the forest garden gathering posies in their pink and green lush garments. The works of John William Waterhouse from Britain (1849 - 1917) show a romanticism and beauty that is uniquely his own. He was born in Rome and lived in England and his other works include La Belle Dame sans Merci, Soul of the Rose, Lady of Shalott, and Jason and Medea. The identity of his female models are unknown. The Gathering Rose Buds tapestry is backed with a lining and a tunnel for easy hanging. Note: tapestry rods and tassels, where pictured, are not included in the price.